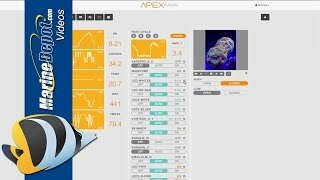 The Apex Jr System delivers a professional quality controller at hobbyist prices. The base unit includes software which is capable of monitoring temperature. The monitored data can be displayed on the LCD display, the Apex`s web page, or through the AquaNotes iphone application. All monitored probes data is logged into the internal nonvolatile memory for later retrieval. All probes support digital calibration. The base unit includes 4 independently controllable outlets. Each of the 4 outlets is rated for a total 8 amps and the total current draw must be less than 15 Amps. All 4 outlets use relays to control the power to the outlets. Galvanic isolation on the probes results much more reliable and accurate probe readings. While these features increase costs we feel that probe accuracy is absolutely critical for monitoring/controlling your tank, unlike many competing aquarium controllers. Over 16 times more code space & 5X faster than competitive controllers, which guarantees future expandability. The Apex has a special control function which can be used to simulate the varying lengths of days throughout the year. This feature is used to make the length of daylight hours longer in the summer than in the winter. This results in a more realistic simulation of natural lighting variations. The Apex has another special control function which can be used to simulate the moon cycle in your tank. The lunar simulator is used for this feature and is capable of varying the intensity of light emitted from its LEDs. The intensity variations are controlled by the Apex which is preprogrammed with correct intensity values for each day of the moon cycle. The Apex automatically updates the intensity value depending upon the current setting of the Apex`s clock. With this artificial moon cycle, it is possible to induce corals and fish to spawn. Each pump to be controlled can have an user configured period in which both the on and off times are fully programmable and can range from 1 second to 999 minutes. A variable length feed timer cycle can be initiated with the press of a button and will disable some or all of the pumps in the system (programmed by the user). Plug and Plug bus allows for modular expansion. 7.5" x 3.75" x 1.80"
Backlight can be dimmed at night. Compact size 3.40" x 4.05" x 0.65"
When you connect Apex Ready certified products to your Apex System, many new options will unfold. How about having your LED lights dim or change color temperature at the touch of your iPad? How about programming your Tunze or VorTech pumps for some serious wave action? That’s what you get when you pair up the Apex System and an Apex Ready certified product. Neptune Systems is one of the world’s leading manufacturers of aquarium controllers. The company was founded in 1995 for the purpose of developing affordable water quality monitoring and control instrumentation. Their engineering team has extensive expertise in computer hardware and software system design as well as a background in water quality analysis. Neptune Systems uses these finely-honed engineering skills to develop innovative monitoring and control solutions for use in reef and fresh water aquariums, aquaculture tanks, hydroponics systems and general laboratory use. Neptune Systems is best known for their AquaController line. The company is known for their innovation and customer centricity. I’m hooked, want to add everything that Neptune Symptoms dales! Handheld controller should be an option? When power is cycled it looses its date and time. Neptune costumer support it atrocious, waited all for email reply and all they told me was how to set the clock! Which I obviously new how to do. They will not take phone calls.